In the most recent filing report, Gov. 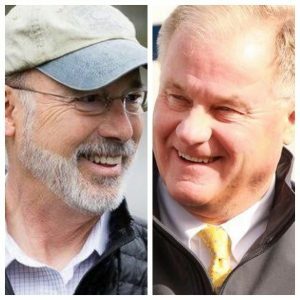 Tom Wolf holds a big cash advantage over GOP challenger, Scott Wagner. Wolf ended the filing period from June 5 to Sept. 17 with a cash on hand advantage of $8.9M, while Wagner ends the period with $1.8M. During this filing period, Wolf spent $13.5M, while Wagner spent $3.4M during this period. The Wolf campaign believes the issues the candidates stand for is truly separating the race. “Governor Wolf is continuing to work to move Pennsylvania forward by prioritizing the issues that matter most to Pennsylvania families, like investing in career and technical education and skills training, expanding access to quality and affordable health care, and providing more opportunities for seniors to age in their homes,” said Karissa Hand, Wolf’s campaign Deputy Communications Director. Wagner spent more in this fourth cycle, than the previous filing period in which his campaign spent $1.8M. Despite the cash disadvantage, the Wagner’s campaign thinks they have all they need. “Scott will have all the resources he needs,” said Andrew Romeo, Wagner for Governor spokesman. Both candidates are independently wealthy and have contributed millions to their own campaigns over recent years. It has been clear that Wagner from the moment the general election started was like an anchor dropped into the ocean. He was going nowhere. He immediately worked hard at antagonizing young people with the foolish statement about being “young and naive” and he got into a bizarre encounter with a tracker at the York Country Club that made no sense and it goes on and on. There has never been a time when Scott Wagner was on solid ground as he has been tripping over himself continually during the campaign. Maybe, it’s he has not had much experience in politics and that he is of the generation that was not raised with computers–whatever the case this is a energetically flat campaign from day one dragged down with ideology out of touch with Pa.
Wagner should be self-funding this thing to the max, but he knows that he doesn’t have a chance against Wolf. Scott has a clue and decided that he’s not going to go bucks up on this one. If Scott was committed, he would be playing this game with his own money. Truth be told, Wagner is a wealthier man than Trump and isn’t dependent upon Russian Oligarch support. Wagner invested campaign funds and lost money. Idiot. I’m sure you’ll be investing in Wagner’s campaign. If he hadn’t lost $2 million in campaign donations gambling, he would have more than double his cash on hand! Of course, he would still have less than half of Wolf’s war chest. This doesn’t say much for his business acumen.